We have a large collection of different types of Podis. 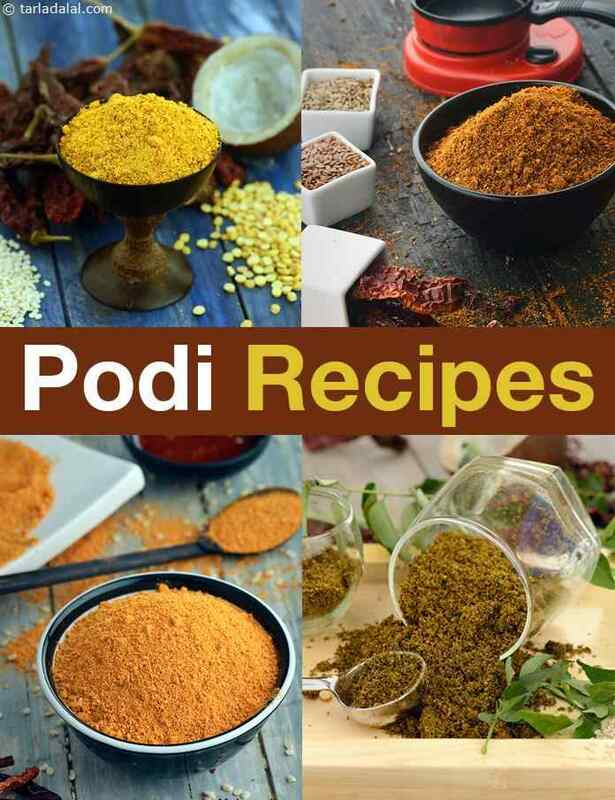 Yes, it's clearly evident that Podis and the different types of Podi recipes are super popular not only in South India but all across our lovely country. Podis are dry powders made with spices, dals and other ingredients like coconut, curry leaves, or dried herbs like coriander and mint. While some podis like Milagai Podi are served as dry chutneys with Idli, Sada Dosa and Sada Uttapas, others like Curry Leaves Chutney Powder can also be served mixed with hot rice and til oil. This section introduces you to a range of such pods. Which Podi Recipe is the most popular in India? The Milagai Podi, fondly called “Gun Powder” by South Indian food fans, is an all-time favourite accompaniment to idlis and dosas. When a spoonful of the powder is served, spice lovers fondly make a small hole in its centre, add a spoonful of til oil or ghee into it, and mix gently with their index finger, to make a chutney like paste with a fresh and irresistible aroma. Peep into any south indian larder, and you are likely to find a good stock of Ellu Podi or dry spice-dal blends that can be served as side dishes or even mixed with rice. The podi recipe just got healthier with the additon of flaxseeds to dry kashniri red chillies giving Flaxseed Podi. Add flaxseed podi with til oil and sprinkle over Uttapas. This flavourful Chutney Podi is sure to make you gobble up an extra Idli or two! Mixed with til oil, this Chutney Podi makes an exciting accompaniment to hot idlis and dosas. Enjoy our Podi Recipes and other South Indian Recipes articles below. Chatneypudi is the pudi which is put on the top of mysore masala dosa and then the stuffing i. e. Aloo subji is added and the dosa is folded and served. This pudi adds the real taste to this dosa. Kulith pudi, it is powder of spices along with kulith. This can be served as an accompaniment for idlis, dosas, chapatis and rice. Karivaepaku podi is a traditional south indian chutney recipe with the fried curry leaves ground with dhania, jeera, garlic and tamarind extact. Enjoy the podi with a little ghee along with hot rice.